Day in & day out, we talk to our kids about how they can improve, what they need to work on, & how to go about doing that. We are, hopefully, offering a lot of praise & encouragement along the way as well! But how often are we asking our children for feedback on how we are doing as parents? 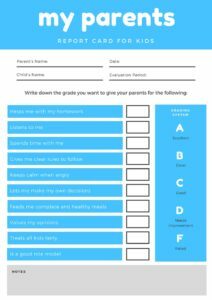 Printing out copies of the parent report card below is a great way to start this process! It will allow you to see things through your children’s eyes & assess areas where you could use some improvement. In order for this to be a positive & helpful exercise, your child needs to feel like they have the ability to share their feelings without consequence or without the fear of hurting your feelings. It is important for them to know that you love them no matter what, & that parents have things that they need to work on to! 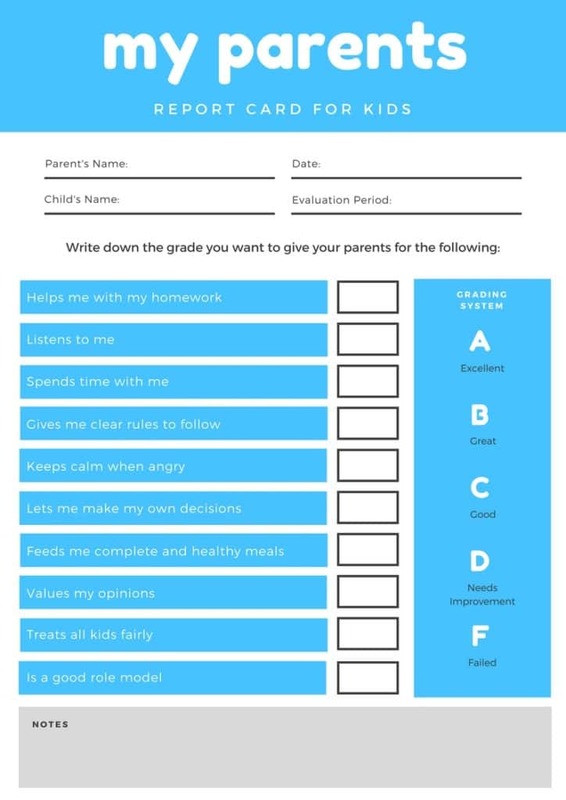 This parent report card gives you insight into your child’s perspective. It may not seem factually accurate. It may not match your perception of the situation. BUT… it is their perception of the situation, which is very important in & of itself. When your child gives the report card back to you, it is very important not to get defensive. You don’t want to start offering a defense of how you do spend a ton of time with them even though they gave you a “D” in that area. This opportunity to bond with your children & improve your relationship will have the opposite effect if you start telling them why their assessment is wrong. Don’t forget to take notice of the areas where your child graded you very highly! All of us have our strengths & weaknesses. You may struggle to get them to eat well-balanced meals, but you may be fantastic at helping with homework. Take those strengths & continue to build on them as well. Take their feedback & ask questions about it. Maybe you spend a lot of time together, but they feel like they need more time with your full attention. Maybe you are a good role model overall, but your child is remembering that one time that you lost your cool & threw a toy across the room into the toy box. Maybe you value their opinion highly, but you are not vocalizing that as much as you could be so that they truly feel validated & heard. Your children’s feedback is a starting point to further conversation – it is never a black & white issue. Take the time to talk things over with a friend or partner as well. If something your child says is hurtful to you, talk it out with a trusted adult – not your child. As parents, we try so hard to be everything for our children; & it is hard to hear that we might be falling short in an area since that is our biggest fear.